A quick glance at a poster for the film The Skeleton Twins and you will likely have the wrong idea of what to expect from it. 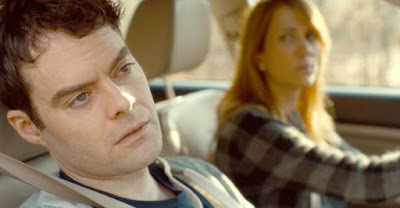 Bill Hader and Kristen Wiig, Saturday Night Live alum that almost certainly promise wacky laughs and silly comedy, are the two stars of the film so I would imagine that the opening sequence would prove to be a bit jarring for an audience looking for their typical material. Bill Hader plays Milo, and we meet him at an inopportune moment, right at a time when he has decided to lie back in a bathtub and we see the once clear water turn red with blood. Kristen Wiig plays Maggie, a woman battling her demons and we don't need verbal confirmation of this as she stands in a bathroom, preparing to swallow a handful of pills. She doesn't though, as what stops her is a phone call informing her that her twin sibling Milo had attempted suicide, a brother that she had not seen in decade. The beauty of the screenplay of The Skeleton Twins is that it somehow finds a perfect balance for these actors, one that allows them to utilize their comedic chops yet it also proves to be a breakthrough for both of them on a dramatic level. The entire film isn't nearly as bleak as that first sequence makes it out to be, as it easily elicited laughter from me and also had moments that were warm and joyous and suited for a smile, but at the heart of the story was a focus on depression, one that felt authentic in this setting with these people. I think the aspect that worked for me the most with this film was the way the characters are portrayed, as real people with real flaws and real issues. Neither Milo nor Maggie are perfect, far from it, but isn't that true to practically everyone? When an issue like adultery rears its ugly head, it isn't handled in a way that would make people hate the cheater and say things like "Why would she do that?!". It's simple, she would do that because she is human and humanity is riddled with flaws and poor decision making and guilt and mistakes and the ups and downs of existence. Hader and Wiig bring a shocking level of nuance to these roles that makes it easy to understand why they lead such troubled lives: because they are real, because people out there right now are just like these two characters and I am sure plenty more have enough similar traits to relate to their plight. Even when they are at their worst, when it seems as if the bottom has fallen out on Milo and Maggie, I found I could empathize with them because something as simple as a look in their eye demonstrated their conscious understanding that what they were doing was wrong and deep down they desired more out of life. They just want to be better. Can't we all relate to that in some way?